Posted on November 13, 2017 at 10:49 am. Brighten up your Monday by playing at Guts Casino, where just by making a real money deposit you can earn extra spins and bonus cash to use on some of the hottest and most popular online casino games. 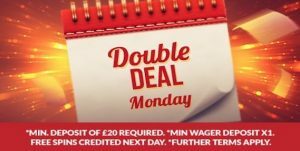 The Double Deal Monday promo is an ongoing offer aimed to reward regular players. Make a cash deposit at Guts.com on Monday, enter promo code ‘DOUBLE’ and Guts will match the amount of your deposit by 40% up to £40. On top of that sweet bonus, Guts will also give you 15 extra spins which will be credited to your account ready to be used on Tuesday on the selected Game of the Week. This week, Guts is putting the spotlight on Sticky Bandits, a premium online slot game by leading software developer Quickspin, which uses a fun wild west theme and is packed with exciting bonus features including a lucrative Massive Wild Symbol and Free Spins bonus game. In addition, this bonus offer can only be granted once you have claimed and used the welcome bonus at Guts. The welcome bonus gives new players up to £300 in matched deposits and up to 100 extra spins spread out over your first four real money deposits. For more information, head to Guts.com and read the fine print for the terms and conditions of all bonus offers. Guts is a leading online casino site offering a huge selection of instant-play games from some of the best software studios in the online casino business. With new games added regularly and big promo offers always available for registered players, this is a popular casino site amongst real money players. To find out more about what this casino has to offer, read our detailed review of Guts.com.